As part of my costume, I crocheted a stripey yellow and black hat and some sleeves to match. I'll put up the patterns for both, starting with the hat. Repeat rows 3 and 4 alternating yellow and black until have 8 stripes. On rows 7 and 11, join with a sl st, sl st in the space between the ch2 and first dc, sc over the top of the sl st. This puts the join on the opposite side of the ch2, which makes the join line reasonably straight. r25 change to black. sc over top of join, ch2, dec x4, join with sc. Fasten off and stitch tail though tops of stitches to close hole. I have a reasonably large head (59 cm), and I made the hat to be a bit loose so it would breathe, so bear that in mind when making this pattern. It should be easy enough to lose a few stitches here and there, or to use a smaller hook - just remember that because of the looseness of the stitch, it's necessary to do two rounds to get an accurate idea of the size. I'm not sure how I just ended up on your blog but I'm glad I did. This is hilarious! 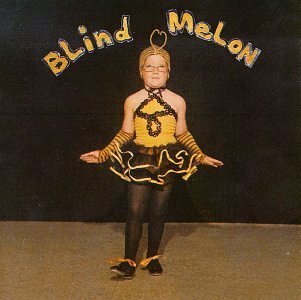 I haven't seen that little "Blind Melon" girl in years. Great idea! Hilarious!